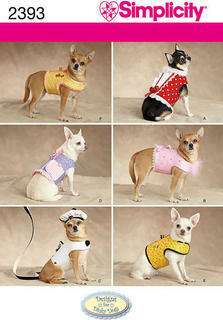 Description: Dog Coats in Three Sizes Have fun dressing your dog in these adorable clothes for small, medium and large size dogs. Hat and scarf included for small dog. All feature hook and loop tape closures for easy dressing. Patty Martin Designs. 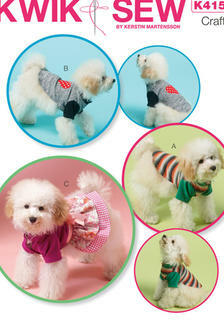 DOG VEST, COAT AND BED IN TWO SIZES : Vest A, Coat B in size Small, Medium, Large and X-Large. A, B are lined. Bed C has cover and pillow in size Small and Large; contrast bottom and zipper opening. FABRICS: Home Decor Fabrics. Lining A, B: Cotton/Cotton Blends. Interfacing 1: Fusible Knit. Interfacing 2: Fleece. 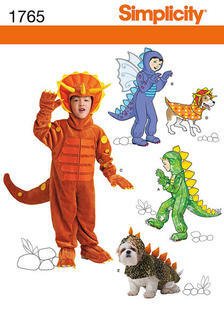 Now your dog can fight crime and travel through time alongside you with these character dog costumes in small, medium and large. Longia Miller for Simplicity. Fleece Dog Coats and Hats in Three Sizes Keep your furry friends warm and stylish this winter in these fleece dog coats in S, M, and L sizes. Click envelope back for sizing detail. 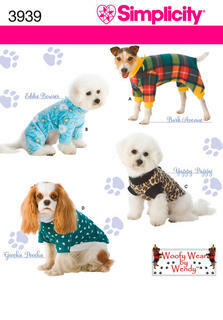 Pattern includes ugly sweater dog coat so your dog can join in on the fun at the holiday party! Holiday Stocking, Tree Skirt, Throw, Cat Bed and Cat Toys Be a creative kitty for the holidays when you make feline-inspired holiday décor. Pattern includes tree skirt, throw, two stockings, cat bed, kitty toys and all cat appliques. 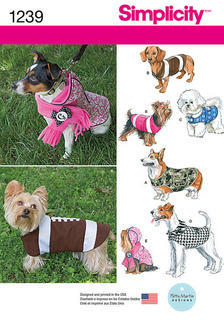 Dog Coats in Three Sizes Play dress-up or simply keep your dog warm with these adorable dog coats from designer Patty Martin. Available in sizes small, medium or large, you can recreate your favorite character with interesting prints or appliques. 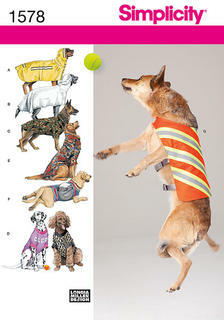 Out Of Print Pet Clothings Pretty and practical accessories for a man’s or a woman’s best friend. They are fun to give and fun to sew. Five different variations range from a sporty shirt to a fanciful frilly coat. 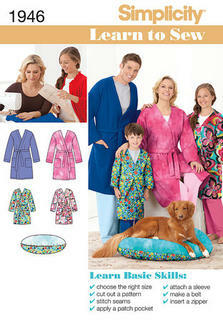 The Pillows, Jacket and Toy are designed for non-fraying heavyweight fabric. We suggest Polarfleece®, blanket fleece, boiled wool. All outside edges are unfinished. Pillows are stuffed and made from two pieces with cut fringes that are tied together. Jackets wrap and tie on back. Dog shirts & dress. The body of these shirts are designed for stretch knits only with 50% stretch across the grain. We suggest fabrics with spandex Lyrca®, swimwear fabric, stretch velour, stretch velvet, and stretch terry. Harness, for small animals in five sizes, is lined, has Velcro® closure at neck and chest, and contrast tab with attached D-ring. 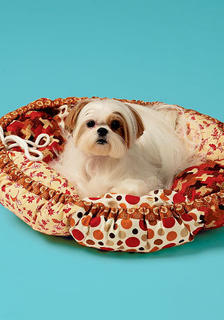 Pet bed in three sizes has bottom with fleece inner layer, removable center pillow, and stuffed sides with fiberfill. Leash has swivel hook on one end and loop handle at other. Pet carrier is made of two different fabrics, has darts on bottom, straps that tie at shoulder and hook on inside. Bag is interlined with fleece. 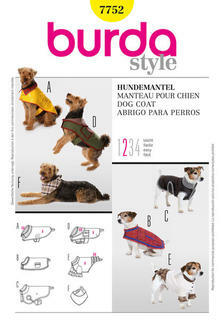 Dog Coats-View A pullover coat has contrast raglan sleeves and neckband and raw edge at bottom. View B has hood, contrast inset and VELCRO� closures. View C has hood, ribbed leg cuffs and waistband, separating zipper closure. Views B and C have buttonholes for leash on back. FABRICS: Designed for Coat A: Stretch knits only with 20% stretch across the grain, B, C: Medium to heavyweight stretch knits. All views have elastic front waist and front Velcro® opening. Top A, B: Contrast neckband and sleeves. View B: Heart appliqué on back. Dress C: Contrast back ruffles and purchased ribbon for bow. FABRICS: Designed for knit and lightweight woven fabrics. Suggested Fabrics: Stretch Knit, Jersey. Contrast 1C, 2C: Cotton/Cotton Blends. 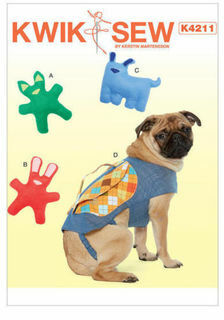 Dog Toys with Contrast Ears and Nose Appliqué, and Backpack with Handle Toy A, B, C have contrast ear and nose appliqués. Backpack D has contrast pockets, flaps, handle and hook and loop tape fasteners. FABRICS: A, B, C, D: Denim, corduroy. Also A, B, C: Fleece/fleece types. Also D: Cotton/cotton types. NOTIONS: A, B, C: Scrap pieces of fabric for appliques, tear-away material, paper-backed fusible webbing and polyester fiberfill. D: 1/2 yd. (0.5 m) of 3/8" (1 cm) Elastic and 1/4yd. each of 1/2" (1.3 cm) wide and 1" (2.5 cm) wide sew-on hook and loop fastener.